Finally on a reliable internet connection here in China, and catching up with emails. Into the Olympic village within the sailing venue now and settled into training. It has been a manic week of getting bits sorted, containers unloaded and packed actually as we helped the Olympic team out at the end of their regatta. We arrived into town in time for the British end of event party which was a good evening given how successful they'd been! An awesome event for the team, and great to have been involved. Lots of news and photos to update, but I'll keep this first China post short. My emotional last moments with my trusty lowrider before the chop. As every good weight-watcher knows regular weigh ins are a must, especially that all important pre-diet number, suffice it to say, the scales didn’t go high enough. On with the first job, stripping all bits and bobs and removing her high performance light weight metal wing bars. Liking this bit, no scary no-going-back saw action yet. Having discovered that cutting things up is strangely satisfying there was no stopping me. Off with the gantry, saw through the bulk heads, jigsaw around the centreboard case and that was it the deck was off. Wanting to minimise the carbon footprint (and impact on bank balance) of the build the deck will be recycled to be stuck back on at a later date. To this end the extra width and the fashionable flares were carefully cut away and the centreboard case was removed (less carefully) with a mallet. Weight: breath in and think light little boat, and the weight is... I could put in something flattering here but I truth I have lost the bit of paper I wrote it down on, will up date you when I find it, at least I can lift her now. Here is a new little video that Katherine put together recently. Let me introduce you to my lovely purple lowrider. Not as fancy as those flashy foilers but my pride and joy none the less. Much though I have enjoyed lowriding I have to admit to being a tinsy bit jealous of said flashy foilers, so when Adam offered me a go in ‘The Weapon’ I couldn’t pass it up. I shan’t wax lyrical about it, I’m sure you all remember how good your first time was. Once ashore I tried to reassure my boat that I still loved her but the writing was on the wall, her lowriding days were over. 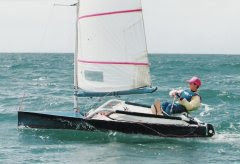 There was only one thing for it, a jigsaw assisted weight loss program and the conversion to a foiler was underway. While the Olympic sailing regatta in Qingdao is held in 5/6 knots of breeze, the 2012 venue has been battered by big breeze again. We got a bit unlucky with the Moth Worlds being such a windy week, and the following two weeks were perfect. Well the breeze is back and has been regularly over 30 knots on the wall since Saturday, except for a small window on Monday. Today it is gusting 45 knots. The 18ft skiffs had their Nationals in Weymouth over Sun,Mon Tues, but only got racing in on Monday. Katherine and I got out for a short sail, and I decided to try and pace the skiffs around the outside of their course. I waited at their windward mark, and followed the fleet down around the outside of their run. I took out one boat on the run, and gained on another. They had depth, I had speed.... 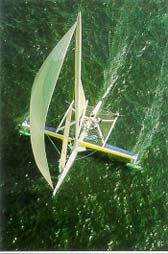 Okay they weren't the front runners but this was an 11ft long singlehander with an 8sqm sail up against an 18ft Skiff! I made a big gain while they dropped and sailed through to leeward up the beat. A fraction lower pointing but fast enough that I could easily sail beyond their layline, tack and cross, and round a fair way to windward of their windward mark with quite a lead. I'd caught up with the two boats battling for 4th and 5th, and started to go over the top, but higher. And then a fair bit higher as I tried to get my camera out to take some piccies of a Moth pacing a skiff! I pulled out there, and went to find Katherine and the mighty mini rig. Whilst watching the Olympics highlights today I caught up with a bit of internet surfing and saw this latest update from Paul Larson on the Sailrocket project. Paul and Helena are off out to Namibia again soon, and I hope all goes well. Paul is doing an awesome job at putting together these videos - he should be doing the media job on a Volvo boat this time around. A friend of theirs John bought Graham Vials' Bladerider and they got out in it the other week. I'll post some pics soon. Loving the live BBC footage on their website each morning. Shame there isn't much wind. Whilst packing up the 2.4's down at the academy today a guy drove up and pulled out a little remote controlled helicopter from his van. This was no ordinary helicopter though, it had a remote controlled high res stills camera slung underneath it. The image from which could be viewed from the ground via funky glasses! With the official opening ceremony today, I'll be glued to the TV until we fly out to overlap with the end of the event. It will be cool to be out in China for the end of the Games and to catch up with everybody out there. The RYA run the Paralympic program as three extra Olympic classes, and so it is funny to now have the Olympics upon us, and we were still out on the water training in Weymouth. Something I'll watch with interest is if Mitch Booth, and the USA team of Lovell and Ogletree use their code zero style spinnakers.... Most of the fleet have tested their own version, most dismissed the idea, but these guys stuck with it. It has the potential to be very quick upwind. When we first went to asymetrics on the Tornado we all played with it in the light stuff, and it was quick but low. 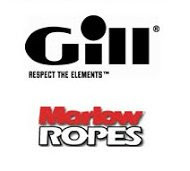 A smaller specific sail could be an interesting weapon upwind, but the penalty downwind?.... It will be interesting to see. Word from China seems to have pretty quiet that the practice races for the Finn and Yngling fleets were abandoned yesterday due to no wind! A light start to the regatta is forecast. I've just seen the results of the Velocitek Speed Challenge during the Worlds. It is impressive for the class to see such a large number of high speeds. In the early foiling days many seemed to doubt the speed of the Moth. I don't think many question it now! I took out the 'Weapon' with Katherine's 6.55sqm mini rig and got 23.7knots out of it, but didn't have an official Velocitek unit on. A check round the back of the academy today saw no moth sized boxes sitting there, so either all the shippers have finally picked up the boats or the local fleet has just got a bit bigger. If you are still waiting for your boat post Worlds, check in with your shipper, they seem to have been pretty clueless about what they were trying to pick up. One picked up a box, just because it had a sticker 'like the one he delivered' and another picked up a Skud 18 mast instead of a Moth. Luckily it got discovered in Heathrow, and some poor Mothie didn't get a nasty surprise. With news of a World Championships amongst Moth bloggers, I’ve been having a bit of an update, and catching up on my blog news. Things have been busy here, but I won’t bore you with any more coaching news as that is all I’ll have to talk about next month. 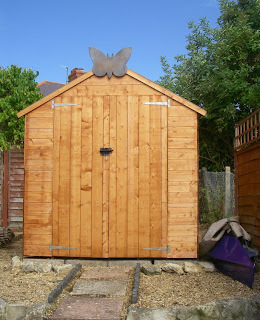 Today’s exciting Moth related news is the new shed alongside my workshop. This now means I can put all those useless things like lawnmower, garden tools and the like in my shed, leaving the workshop free for interesting Moth related projects! A slight wood splitting incident when adding the final touches resulted in a last minute Moth related mod to cap the roof joints! So what is scheduled for the workshop next? · A full tidy up, with everything getting its own home, and putting up my tool rack on the wall. 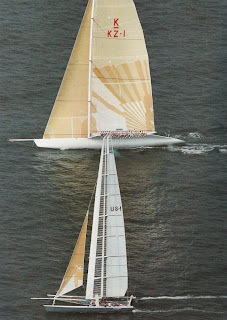 · Katherine’s lowrider is being pimped into a modern foiler. We’ll use the hull and a bit of the deck from the original boat, and chop away any unnecessary structure. We are looking good for a weight reduction of around 10kg at the moment, but we’ll post full details here as we go through each stage. It won’t be a quick transformation, but I’d like to post enough info so others could do the same as well if they’d like. · The ‘Weapon’ will be used to test a few of my more silly ideas. · ‘Envy’ will be continued to be refined. Playing with foil set-up and tuning. New boom and spreader unit to be added shortly. 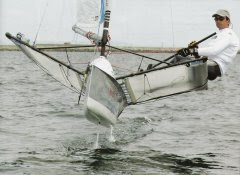 During the Worlds I spoke to Toby Heppell about an article that he’d written on www.thedailysail.com about Thomas Jundt’s foiling skiff that he’d taken down to the Europeans. The fleet didn’t seem to friendly to him, and I asked Toby for Thomas’ email address so I could get in touch and let him know that any Moth sailor I’ve spoken to thinks what he’s doing is great. Here is his latest creation ‘Mirabaud LX’. 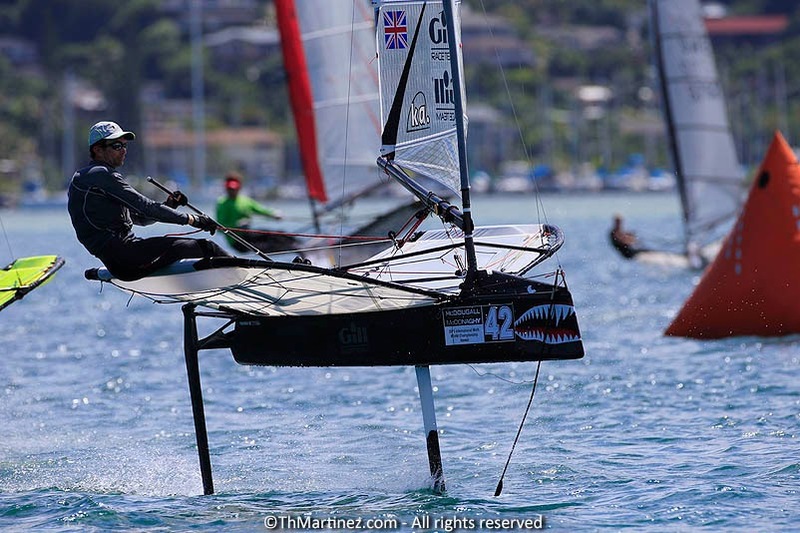 Check out the foiling gybe just under 1min in. Team GBR’s Beijing Laser Radial rep Penny Clarke sent her husband Russ down to the Worlds with the strict instructions of getting her a Moth so that she had one waiting for her on the driveway for when she got back from China! I know Russ and Penny from the Olympic circuit and from coaching them in F18’s. I introduced Russ to Mark Robinson, and the deal was done. So we have a growing female contingent in the UK Moth fleet. Penny now joins, Katherine, Clare, Helen, and Emma. Penny will be on the water at Stokes Bay on return from Qingdao. 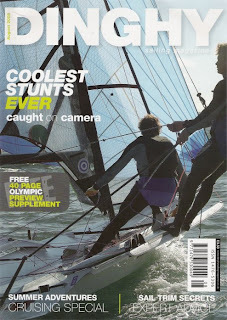 The August issue of Dinghy Sailing magazine includes a feature on the ‘Coolest stunts ever’ and it has a large moth presence. 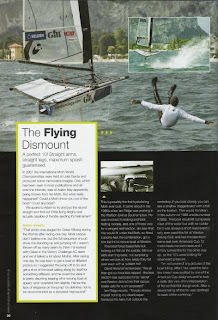 There is the pic of me jumping off the boat in Garda, James Roche’s crash recovery at Grafham, and a nose plant by Mike Cooke. I was actually quite looking forward to a Deed of Gift America’s Cup. The prospect of 100ft long multihulls battling it out for the cup was an exciting prospect, and what about the development potential when two huge AC teams throw themselves into multihull sailing? Multihulls out of the Olympics and into the AC seemed only fair. 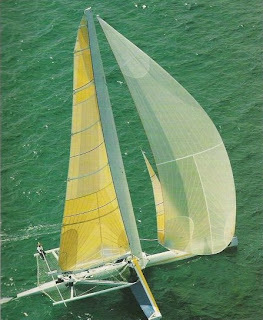 I’d just started sailing when the 1988 Deed of Gift Cup was on, but I remember well the TV footage of that event with the huge Kiwi monohull, and Conner’s wingsailed catamaran. They were cool boats. 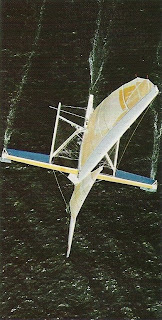 And what about Blue Arrow, the foil stabilised monohull that Peter de Savary tried to join the competition with? That was a ‘craft’ well ahead of its time. And they built it in 11 weeks! This boat was unveiled to the press almost exactly 20 years ago. What could a Deed of Gift AC have produced this time around?